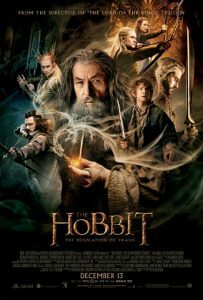 As expected, “The Hobbit: The Desolation of Smaug” tops the box office this weekend with an estimated $73.7 million dollars earned at the box office. However, “Frozen” still hangs on in the #2 spot earning $22.2 million, for a total take so far of $164.4 million. “Thor: The Dark World” is in fifth place, earning $2.7 million for a total box office of $198.1 million. “The Best Man Holiday” finally fell out of the top 10, but has earned about $69 million to date, four times what it cost to produce. Not bad for a “race themed film.” Meanwhile, “A Madea Christmas” opened in third place, earning an estimated $16 million, which is lower than what Box Office Mojo projected. Since “Madea” probably doesn’t cost much to produce (no budget figures available, but Forbes guesses around $20 million), it should be profitable even despite next weekend’s competition (“Anchorman 2”). Once again, three of the top five films at the box office this weekend stars minorities or women.